According to new research, 67% of UK consumers have abandoned an online retail transaction due to the payment process, only down 1% in the past four years from 68% in 2014. With the biggest reasons cited as 22% didn’t recognise the payment process up from 6%. However, there have been some improvements in checkout processes; previously over half (57%) abandoned the payment process due to it being too complicated, four years later this has reduced to 21%. Yet, a quarter still abandon processes as the retailer doesn’t offer the option the pay with alternative payment. Consumers increasingly expect a variety of payment methods to be made available when they shop online, in fact this demand is up 10% in the past four years to 90%. Yet 15% claim their expectations aren’t met and 77% stated they would not be happy to pay for goods online if they only accept payment methods they hadn’t heard of. The statistics demonstrate that retailers must align their checkout processes with customers preferred payment methods. 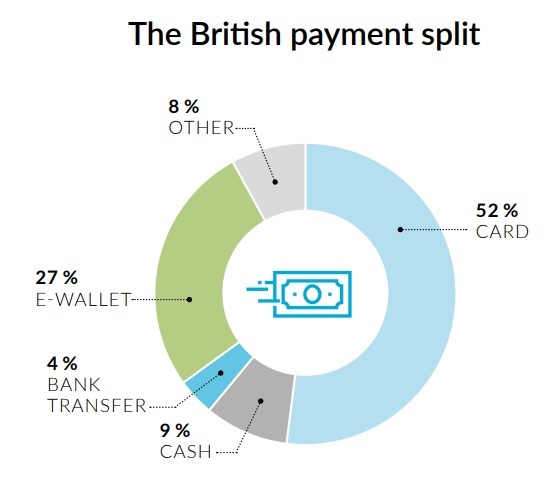 For example, half of UK consumers state that PayPal (is their most popular method of online payment, while more unfamiliar methods, such as Direct Debit at 3% up from 0.3% and e-wallets at 1%, are creeping into the UK market for the first time.